After a forced week-long vacation, I’m back on the site. Spe nding a week of evenings digging up your yard like a meth-addled marmot really makes you appreciate sitting in front of a computer. And while I can’t CONCLUSIVELY prove Matt was the one who did it…well, I also can’t prove he didn’t. At any rate, here are this week’s new and noteworthy titles. 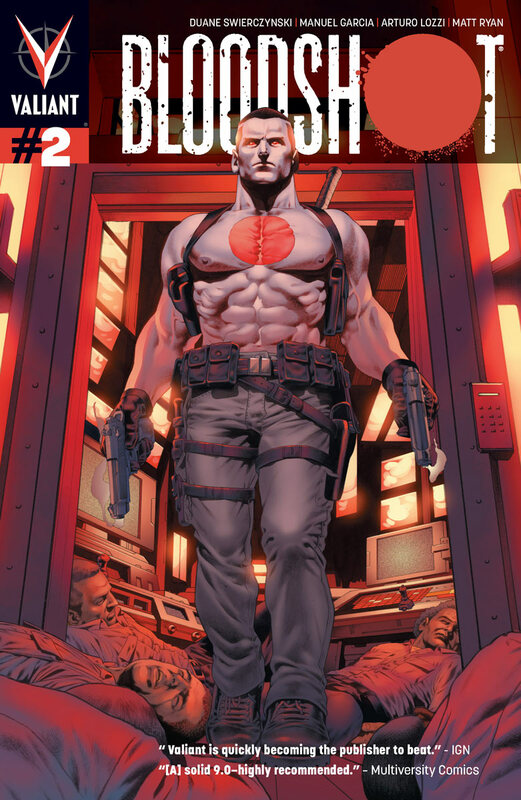 BLOODSHOT (ONGOING) #2 – I asked Valiant Comics themselves what title I should pick up that would convince me to pick up the rest of their line. Advice was pretty fairly split between Bloodshot and X-O Manowar. Since the X-O preview didn’t really strike my fancy and I’ve got a soft spot in my heart for ol’ Bloodshot, I went with him. And it was a really good book! Valiant is taking the core of the character — a guy whose blood has been replaced with nanites — and using that concept in some pretty novel new ways. Oh, and adding characterization. That’s a plus all-around. (Of course, now I have to ask: where’s Rai???) I snagged my LCS’s last copy of Archer and Armstrong, the other book I was looking forward to (thanks again to a solid remembrance of the last run and Fred Van Lente writing), so expect more on that later in the week. 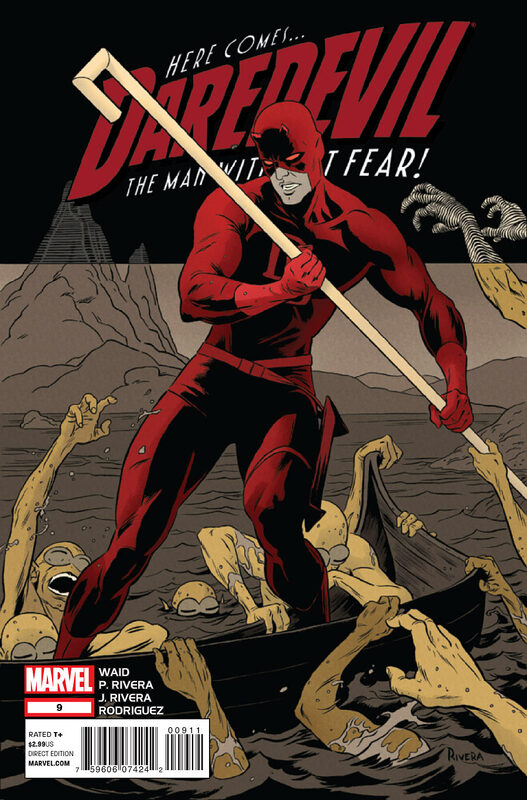 DAREDEVIL #17 – Waid. Allred. Daredevil. CROW #2 – They managed to take everything you know about The Crow and make it BORING. Man, so little happens! I’m sitting this one out. PIGS #8 – Huh, I thought Pigs was wrapped. Well, I’m glad to see it’s back. ROGER LANGRIDGES SNARKED #11 – At this point it’s just better to wait for the trade, as the next issue will be it’s last, but rest assured the quality has ramped up considerably since the middle doldrums and it’s as fun as ever. 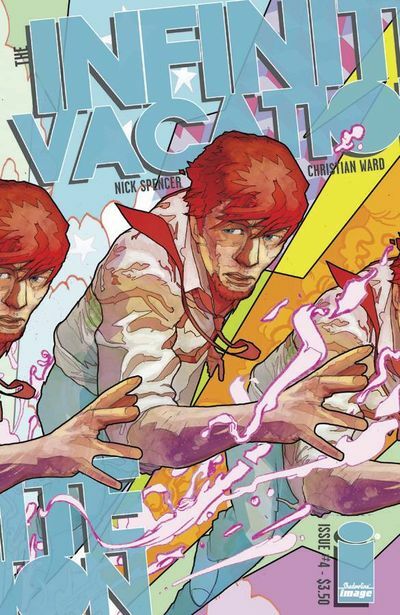 SAGA #6 – Brian K. Vaughn’s space/fantasy epic just wows me. It feels like nothing he’s ever done before, yet the sci-fi seems to come naturally. This is a fun ride, though it may be time to move to the trade. SAUCER COUNTRY #6 – I think I’m done. Like Matt, I’ve just been underwhelmed by the pacing and lack of anything going on. It’s a shame, because the high concept is great. 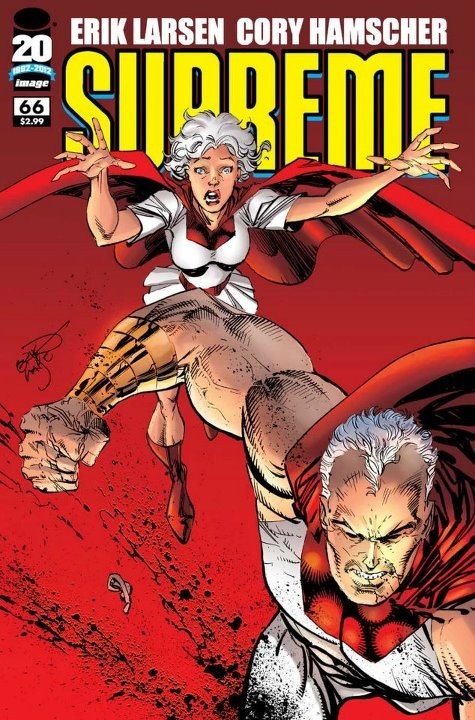 SUPREME #66 – I still feel weird picking up Supreme, but Larsen HAS been doing a great job. And that’s it for this week. What looks good to you? Such a fun batch of comics this week! Here’s this Wednesday’s new and noteworthy titles. AXE COP TP VOL 03 – I skipped Volume 2 because I picked up Bad Guy Earth in the single issue format, but with volume 3 the Nicolle bros. continue the printing of their webcomic. Damn fine madness! BATMAN ODYSSEY VOL 2 #6 (OF 7) – Kudos to DC for getting their act together on this book, as it’s been shipping pretty regularly. Unfortunately, volume 1 was unreadable, so I’ve passed up volume 2 completely. PROPHET #23 – The first arc of the “All-New, All-Different” Prophet wraps here. Good, low-key sci-fi that you should be checking out. REED GUNTHER #9 – Despite reassurances from several sources that this is a good read, my LCS doesn’t get it! So I may never find out. ROCKETEER ADVENTURES 2 #1 (OF 4) – I’m very glad to see this Rocketeer anthology return, and the news of an ongoing is certainly welcome, as long as IDW doesn’t oversaturate the market with poor content (see: Godzilla). STEED AND MRS PEEL #3 (OF 6) – I wound up missing issue 2 and then realized I didn’t really miss it. Should I go back and give it another try? THUNDERBOLTS #171 – My enthusiasm for this book as been waning; I think it’s stretched too thin by the publishing schedule, but it’s still pretty solid. Enjoy it now before it becomes Dark Avengers! I haven’t had a chance to read any of last week’s new comics, but that’s okay because I found a copy of Daredevil #1 (the new series, let’s not get crazy) and got to read the first four issue of Mark Waid’s new title. I mentioned being impressed by #8, but 1-4 prove it’s not a fluke. Matt and I met up a couple weeks ago and he mentioned he’s never been a Daredevil fan. We didn’t get to delve into that any further (I suspect daredevils killed his family when he was a small child), but this is definitely a DD run unlike any other, so I feel it’s worth examining on it’s own merits. It doesn’t diavow anything that’s come previously, but it definitely takes the approach that the character is getting a fresh start. For one, it’s not a dark, dour affair. And complimenting that, it’s definitely a superhero book. In these first issues he fights The Spot and Klaw. The Spot, for crying out loud! And not just played for laughs. Marcos Martin and the Paolo/Joe Rivera team are swapping off the art duties. Both are incredibly strong draftsmen and storytellers, and both have novel new ways of displaying Matt’s radar sense, but if you made me choose, I’d pick the Riveras as the stronger team, if for no reason OTHER than how they showcase the radar. It’s truly amazing. 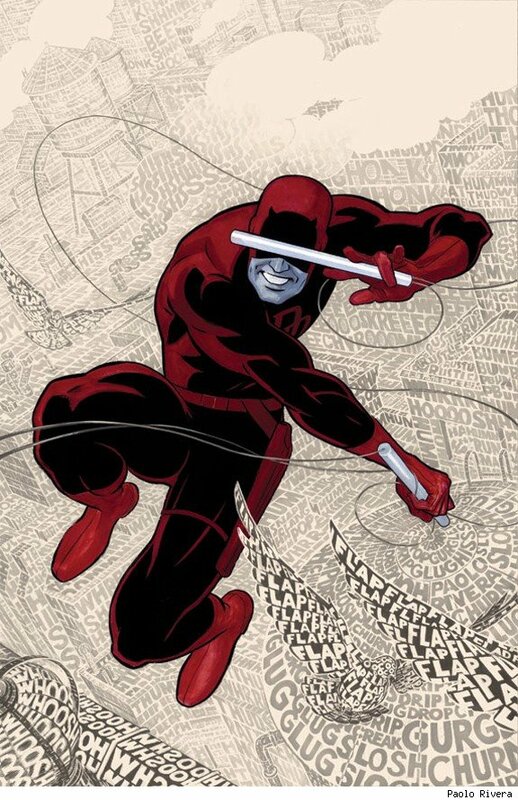 If you — like Matt — have been on the fence (or are off the fence completely) on Daredevil, if you enjoy superhero comics you’ll enjoy Daredevil. The comic springs to life in your hands, and it’s enthusiasm is contagious. That said, that’s enough for this week. What’s looking good to you? Since it launched, I’ve had Mark Waid and Paulo Rivera’s Daredevil on my pull list. I haven’t been able to track down the first issue, though, so I also haven’t been able to dive into it, even though I’ve heard nothing but great things. Well, with issue 8 concluding the Spider-Man crossover I figured Daredevil #9 would be a good place to take the plunge and actually get to read the thing! 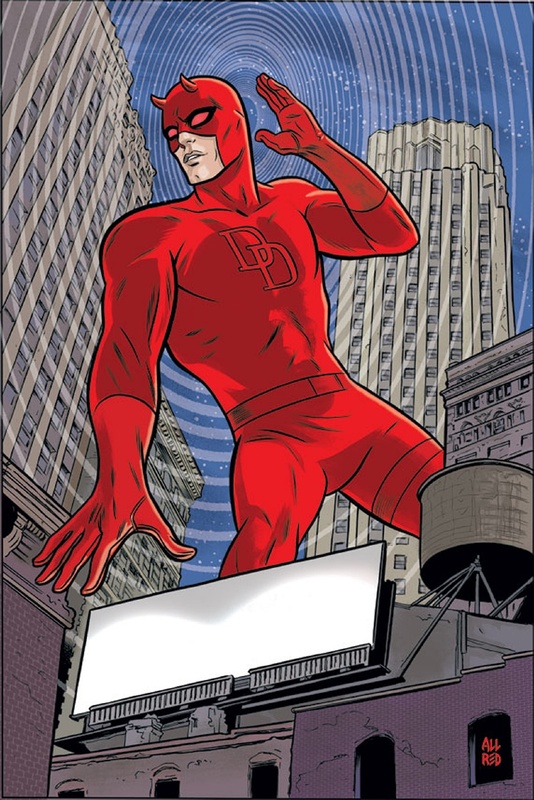 I needn’t have been concerned, as Mark Waid is obviously too good a writer to be dismissed due to trending styles, as he gets the high concept right with Daredevil and still manages to nail the nuance and characterization any good comic needs. Matt Murdock heads underground on the trail of coffins exhumed from a New York cemetary by the Moloids, for purposes unknown. As he follows them further and further underneath the city, Rivera’s artwork REALLY gets to shine. It’s moody and eerie, as befits a Daredevil comic, but where he really shines is his representation of Hornhead’s radar sense. It’s graphic, detailed, and truth be told, how I always figured DD “sees” the world around him. And then there’s the nicest touch: Waid and Rivera have CLEARLY thought about the benefits and limitations of a radar sense. 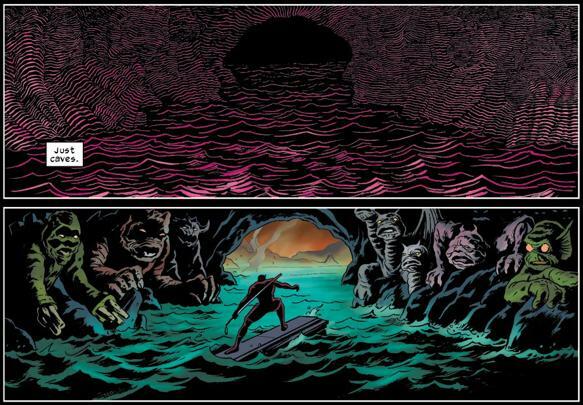 The panel of Daredevil navigating down the underground river is nothing short of amazing. I haven’t been this excited about finding a new comic since I discovered Atomic Robo. If you’ve been looking for something new to check out or just want to see how good a superhero comic can get: Waid and Rivera’s Daredevil. What INFERNAL ACROBAT was seen at Spago claiming he COULDN'T READ it was the women's restroom?! Which FELINE FATALE was busted throwing CATsup packets at HALLE BERRY'S mansion?! What PUMPKIN EATER was seen filling his GLUE GUN with something other than ELMER'S?! Which MOBILE ORGANISM was almost KILLED for yelling AIM slogans at a Hydra rally? !